Convert Doc to XLS via Cmd with Coolutils. You are here: CoolUtils > Total Doc Converter X > Convert Doc to XLS via Cmd with Coolutils. Converting Doc files to XLS format is a trivial task for those who deal with commercial documentation, publishing, etc. If you would like to optimize software used in your office for these needs, install Total Doc ConverterX on your local server, so that all users of your local computer network will be able to use one license. This handy and efficient Doc XLS converter for web-server is powerful enouhj to convert hundreds of Doc files to Excel in batch. Adjust automatic conversion by preliminary set schedule. While for this Doc to XLS converter no GUI is implied, you can run conversions through the interface of another web service. This is possible thanks to ActiveX technology that is provided in the installation package. If you convert Doc into Excel through web-server, the application processes requests from different users in turn. By default Total Doc Converter X works from the command line. Enabling the converter is easy and requires minimum skills. All conversion parameters are defined in the command, similarly as it is done in a desktop version. You can convert any number of Doc files in one batch, can even select a file folder as a source for conversion. This convert Doc to XLS command line utility works very fast, processing big number of files in seconds. 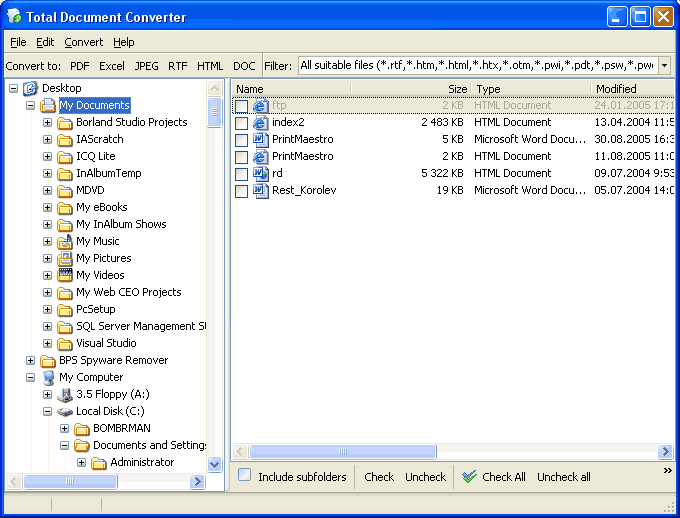 You can adjust Total Doc ConverterX to any conversion need you have. It supports different text and image formats, so you can easily turn document to texts, tables or images using only one utility for all possible conversions. Both licensed and free trial versions are available. Try them now!